Splotch was published on the occasion of the two-venue exhibition at Sperone Westwater and Lesley Heller Workspace (now Lesley Heller Gallery). The catalogue includes essays by Eileen Jeng Lynch and Robert C. Morgan. Copies of the catalogue are available in the store. “Splotch” connotes a shape created haphazardly or spontaneously, and it is defined as “a daub, blot, or smear of something, typically a liquid” as well as “a large spot or mark of dirt, paint.” The latter definition implies that a “splotch” occurs in various forms, is distinct from its surroundings, and can be unwanted. Paint and dirt are peculiarly treated equally — as accidental stains or imperfections. However, a splotch can be deliberate and welcomed even if it is unintentional — across generations, cultures, and mediums — as demonstrated in art historical contexts and in the two-venue eponymous group exhibition at Sperone Westwater and Lesley Heller Workspace. Splotches encompass the marks made in ink art inspired by the controlled brushstrokes of Chinese calligraphy,  the blotches in Fra Angelico’s quattrocento paintings in the convent of San Marco in Florence that have been analyzed by art historian Georges Didi-Huberman, and the inadvertent blots that Joan Miró incorporated in his canvases. With less structured approaches and more spontaneous actions, Jackson Pollock created splatters, and European artists, associated with Tachisme, employed fortuitous applications of paint in their non-geometric abstractions. More recently, conceptual artist Sol LeWitt created his three-dimensional fiberglass pieces titled Splotches from 2000 to 2007. These sculptures and their working drawings — or “footprints” — inspired the title and premise of this group exhibition. LeWitt is known for his modular and geometric structures as well as rule-based systems. His use of the title Splotch for these later three-dimensional pieces appears paradoxical at first. This notion of LeWitt’s work was suggested in a conversation between Lawrence Weiner and John Ravenal, former Sydney and Frances Lewis Curator of Modern and Contemporary Art at the Virginia Museum of Fine Arts. Ravenal noted that Weiner once described LeWitt as the last of the Abstract Expressionists, perhaps commenting on "his [LeWitt’s] command of monumental scale, mastery of color, distinctiveness of voice, and overall expressive power that, nonetheless, was founded on a rejection of just these sorts of concerns in the Abstract Expressionist generation that proceeded him." The progression of forms and colors in LeWitt’s oeuvre proves that he was a firm believer that “once you reach the end of something, it opens the beginning of something else.” He continues, “I always try doing what the next thing was instead of doing the same thing over and over again.” Therefore, the emergence of organic shapes was a progressive development, not foreign to LeWitt’s way of working. The 29 artists in this exhibition create work that portrays seemingly free-form or random daubs and spots through methodical and controlled processes. The works by the diverse group of emerging and established artists investigate and expand the concept of a “controlled splotch.” Utilizing predetermined and self-imposed rules, the artists explore the boundaries of various mediums as well as the tension between control and spontaneity. Their approaches are structured, yet left up to elements of chance and failure. Through their formal qualities, the works depict organic, biomorphic, and amorphous shapes as a manifestation of process, imposed or otherwise, that provide a new way to look at materials and methods. With a range of traditional and nontraditional materials, including acrylic and oil paint, ceramic, paper, canvas, carpet, and larvae, as well as varying techniques — from painting, pouring, cutting to burning — the artists employ different degrees of chance, and some more than others. Like LeWitt, a few artists incorporate the architectural space. These artworks also document a passage of time, action, and movement, as well as a concentration of energy — for example, as in the works of Lynda Benglis, Trudy Benson, Keltie Ferris, Andreas Kocks, Sol LeWitt, Takesada Matsutani, Otto Piene, and Brie Ruais. There are intimate observations of the microcosm and, at times, of a macrocosm — as artists also examine pop culture, nature, science, technology, and cultural identity, among other subjects, such as in the works of Mary Heilmann, Riad Miah, Jamie Powell, Karen Tompkins, Terry Winters, and Nicole Awai. The concept of the exhibition expands beyond the artists in the exhibition, for one can recall the sculptural brushstrokes by Roy Lichtenstein and the Splats by Polly Apfelbaum. 1 “Splotch,” Oxford Dictionaries online, http://www.oxforddictionaries.com/us/definition/ american_english/splotch. 2 “Splotch,” Merriam Webster Dictionary online, http://www. merriam-webster.com/dictio- nary/splotch. Furthermore, a spot is defined as “a small area visibly different (as in color, finish, or material) from the surrounding area.” “Spot,” Merriam Webster Dictionary online, http://www.merriamwebster.com/dictionary/spot. 3 Flexible hair brushes started to be used regularly in Chinese calligraphy in the Han Dynasty (206 BC–220 AD). “Chinese Calligraphy,” The Met’s website, http://www.metmuseum.org/toah/hd/chcl/hd_chcl.htm. 4 David Reed and Riad Miah, e-mail message with the author, June 12–23, 2016. Georges Didi-Huberman, Fra Angelico: Dissemblance and Figuration, trans. Jane Marie Todd (Chicago: University of Chicago Press, 1995), 2. 5 The process of color field painter Mark Rothko has been described as experimental but more methodical than the other Abstract Expressionists. 6 The museum acquired Sol LeWitt’s Splotch #22 (2007) in 2007. John Ravenal is currently the Executive Director of deCordova Sculpture Park and Museum in Lincoln, MA. 7 John Ravenal, “Continual Surprise” in Sol LeWitt: 100 Views, ed. Susan Cross and Denise Markonish (North Adams: MASS MoCA/Yale University Press, 2009), 91. 8 Sol LeWitt in conversation with Gary Garrels (Elise S. Haas Senior Curator of Painting and Sculpture at the San Francisco Museum of Modern Art) at the Museum of Contemporary Art, Chicago in 2001. “Sol LeWitt: 4 Decades,” Vimeo video, 0:58, posted by Michael Blackwood Productions, January 24, 2016, http://www.michaelblack- woodproductions.com/old/ artm_lewitt.php. Guest contributor Eileen Jeng / The exhibition “The Still Open Case of Irving Petlin: From the Years 1960 to 2012“ at Kent Fine Art comprised a selection of the artist’s paintings and pastel drawings spanning over five decades. After World War II, Petlin moved away from the bold aesthetic sensibilities of the Chicago Imagists and the Monster Roster, which included an older generation of Chicago artists such as Leon Golub and Nancy Spero, towards a more surrealist approach. He developed a penchant for creating allegorical works, informed by his personal experience, historical and current events, mythology, Biblical stories, and literary writings. With an idiosyncratic approach, the 80-year-old artist creates unsettling yet imaginative, thoughtfully executed works. Over a career that began in Chicago in the 1950s, Petlin also worked in Paris and New York, where he currently lives, spending summers in Martha’s Vineyard. He also had stints in San Francisco and Los Angeles for teaching appointments, military duty, and anti-Vietnam War activism. The dark-walled, dimly-lit front gallery at Kent Fine Art housed a re-creation of Petlin’s studio in Paris in 1960 – a desk and table with buckets of coated paint brushes. The installation also included two early paintings and Table of Heads (1974-2011), a multi-part piece consisting of 20 enigmatic portraits on canvas, arranged tightly on a table. In these small paintings, the influence of French symbolist Odilon Redon was evident; the large-scale paintings in the main gallery evoked Belgian artist James Ensor and Chilean surrealist painter Roberto Matta. In the diptych The Eleventh of January (2009), which was previously titled Gaza/Guernica, Petlin depicts the tragedies of war, particularly attacks on defenseless civilians like, as suggested in the early title, those that have occurred in the Palestinian territories and the 1937 bombing of the Spanish city during the Spanish Civil War. The notes next to the painting, however, only focus on Gaza. With figures painted in bold colors in the foreground, mere outlines of a mass of people in the background, and strokes and splotches of red and orange paint resembling blood and fire, Petlin leaves the viewer to fill in the rest of the story. Perhaps he changed the title to leave the work open to broader and more contemporary interpretation, as the title of the exhibition seems to indicate. In the large-scale work Hebron (1998-2001), Petlin utilizes chalk and oil on unprimed linen to create outlines of figures and smears of red paint and chalk, indicating bloodshed. Petlin’s works are powerful and emotive. From some referential elements, one can determine the subject matter–for instance, the Cave of the Patriarchs Massacre of Palestinian Muslims in the mosque in 1994; the city of Hebron is a site of continuing conflict today. Petlin often depicts or alludes to water. Elusive early paintings, such as Révolution Pastorale (1978-1981), provide a seemingly idyllic memory (after the Vietnam War, according to the notes) with ancient spiritual figures on the bank of a river. Motifs, such as the corner of a stretcher bar, from his earlier series “Rubbings from the Calcium Garden” also appear in this work. In Petlin’s pastel drawings, specific events and places are not as decipherable as they are in his paintings unless there is a titular reference. In the three-part pastel work on handmade paper Abandoned Forest (Broken Boat) (2012) and the diptych Morning of the Other Window II (2007), Petlin utilizes recurring imagery of a boat, forest, and cottage. In the former, a broken boat is lodged into the trees on one side of the work, while small, ghostly white figures are wandering on the opposite side. In Morning of the Other Window II, there are animal-like but not human figures, in contrast to Petlin’s other works on paper and paintings in the exhibition. Even so, the human presence is implied with the warm glow of light in the cottage window. Figures appear and disappear in Petlin’s work–a poignant reminder of our mortality. “The Still Open Case of Irving Petlin: From the Years 1960 to 2012,” Kent Fine Art, Chelsea, New York, NY. November 8 – December 20, 2014. Guest contributor Eileen Jeng / Sara Greenberger Rafferty’s exhibition at Rachel Uffner Gallery explored the themes of performance, stand-up comedy, media culture, and gender identity that have preoccupied the artist for almost a decade. With several large-scale wall pieces of irregularly-shaped Plexiglas, screws drilled through acetate into the wall, and a polysilk curtain installation, Rafferty employs new mediums while continuing to challenge the definitions of photography, sculpture, and painting. The cohesive and impressive two-floor exhibition of Rafferty’s work, all dated 2014, suits the large, new space on Suffolk Street. Upon entering the gallery, one sees a lone work, Untitled, which sets the stage for the exhibition. The piece comprises layers of inkjet prints on acetate – a door with an “Audience Entrance” sign and what could be seen as pulled blinds or lined notebook paper – as well as paint and solvents. The appropriated prints are damaged with water through Rafferty’s recognizable “waterlogging process.” In the main space, on large Plexiglas fitted with a clear handle are images of two microphones – one more mangled than the other – and ghostly feet. Acrylic polymer is smeared in the background, resembling perhaps a curtain or pie splatter. There is an honesty that has always been present in Rafferty’s deliberately unpolished-looking work. While the artist certainly does not hide her process, it can be perplexing to discern – it requires a continual examination of the surface. Rachel Uffner explains that Rafferty applies the paint on one side of the acetate and then flips it over. 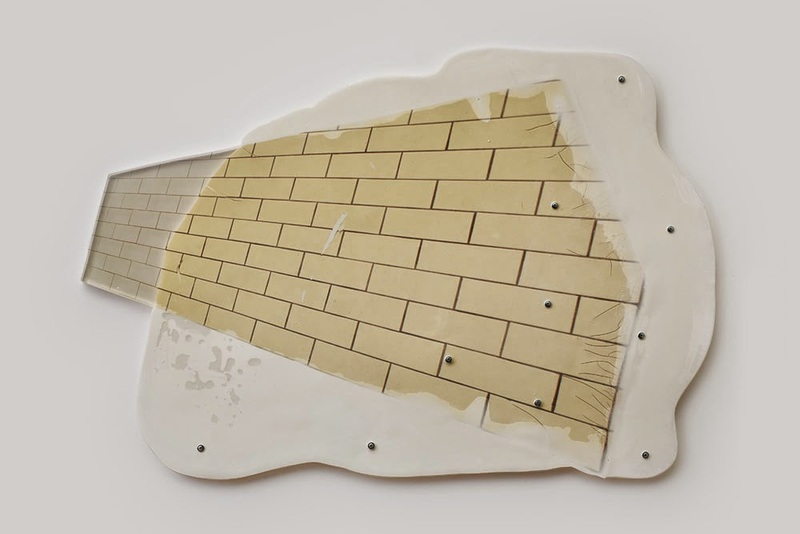 As noted in the exhibition’s press release, Rafferty utilizes theatrical tropes, including a stool, noose, and stage sets, as well as the quotidian, such as flies and bathroom door signs. An almost floor-to-ceiling piece on plastic, Printed Frame with Stool, depicts a single stool on a white background in a multi-colored frame. Images of numerous flies and a clear plastic collared shirt are mounted on a white polysilk curtain, which takes up the entire back wall of the gallery. With the implication of a human presence, Rafferty’s work deals with humor and the absurd, yet there is a sense of melancholy, leaving an unsettling feeling in the viewer. Vague representations of the female body, including self-portraits, make some of the works more personal. Rafferty’s work continues to fascinate and intrigue, and it will be interesting to see what direction she goes in next. “Sara Greenberger Rafferty,” Rachel Uffner, Lower East Side, New York, NY. October 26 – December 21, 2014.